Is your Journal Article Peer-Reviewed? Is a Journal Article Peer Reviewed? Articles in peer-reviewed journals are reviewed by a group of the writer's peers (other academics in their field) before the articles are published. Not all journal articles are peer reviewed because not all journals are peer reviewed. It might sound confusing, but you know that an article is peer reviewed if it comes from a peer-reviewed journal. Peer reviewed and refereed are synonyms for the same process. How do you know if the articles in a journal are peer reviewed? Some databases allow you to limit to peer-reviewed articles. 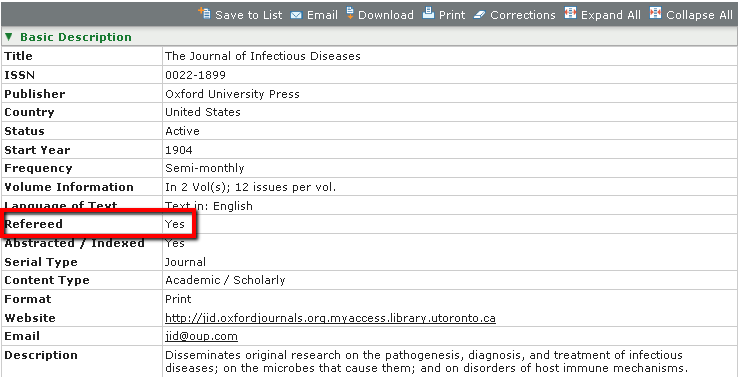 For other databases, you need to look up the title of the journal in Ulrich's Periodical Directory. 2. Type the JOURNAL TITLE (not the article title) into the search box, and click the green search button. 3. In the search results, look for a referee jersey icon to indicate that a journal is refereed, which is a synonym for peer reviewed. 4. Or you can click on a journal to see the full record. If it says Refereed Yes, then you know the journal (and the articles published in it) are refereed/peer reviewed. In this case, the Journal of Infectious Diseases IS peer reviewed. Recognising the difference between scholarly and popular publications is an important skill. This short video from Vanderbilt University illustrates how to recognize scholarly articles.